Some heavy promotion, with hyped reviews and extravagantly inclusive CVs (together with unavailability to cover a new reincarnation of The Primrose Piano Quartet at Wigmore Hall) combined to prompt me to listen again to music which is outside our usual fields of interest. Are we unduly prejudiced against native contributions to the earlier years of the last century? Of particular interest are the commentaries by Francis Pott, a composer who has engaged our attention in recent weeks. It is professorial stuff, lengthy and in small (but legible, no-nonsense black-on-white) print. Pott is steeped in tonal idioms (as a composer, those imprinted during the "choirboy experience", which he discusses in notes for his CD of Meditations & Romances, in words virtually identical to those which introduced his magnum opus for choir The Cloud of Unknowing: "music predicated on doubt - - articulation of uncertainty", which is scheduled to be recorded by Signum. Meridian doesn't make things too easy. The pages are unnumbered and the pagination peculiar, with the composers discussed in a different order to their presence on the discs themselves, and (in the first one) with scant use of bold. 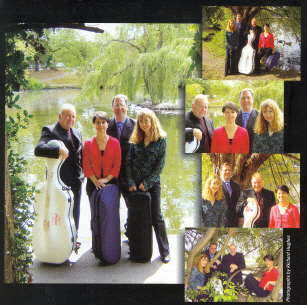 They confuse us by telling of the new Primrose Quartet personnel, with two former members of The Lindsays, a change which happened after both these CDs were made. And on the latest of the two insert booklets they preempt responses with fulsome qotes of praise from The Strad and Music Web: "really spirited reading with the engineers and any one else attending the sessions surely having had to bite their lips at the end to avoid a shouted and thundered applause" which have to be countered by The Times ** put-down of the Wigmore Hall launch concert: "Projection is simply not all. - - (re Hurlstone) in a blind testing, you'd be hard put to it to know whose was the brew - - This ensemble needs to search far more deeply into the structure and nuancing of what they play". I enjoyed best the "vehement" Bax (dedicated to his mistress, "the ambitious young pianist Harriet Cohen") and the Bridge Phantasy Quartet for Cobbett, which "eventually comes to rest in an F# major still overshadowed by tangential hints of its minor equivalent..."
All in all, a better read than a listen. Advertising is fine in its place, but counter productive to read after you've bought a disc! Other responses would be welcomed? See also review by Ying Chang: - - Very pleasant listening, although those brought up on the Schumanm, Brahms, Dvorak and Faure quartets will be left wanting something more, from both composers and performers.